WikiLeaks founder Julian Assange exploded the bubble of widely touted leaks for upending the US election at his videoconference in Berlin Tuesday, Oct. 4, by a strangely anemic appearance. There were no revelations, only vague promises of a million leaked documents on the US election, wars, oil, Google and three unnamed governments. He said: “There's an enormous expectation in the United States – part of that expectation will be answered… but we won't do it at 3am.” – i.e. on this occasion. He went on to deny his intent to destroy Hillary Clinton as “false,” but he also promised to publish US election leaks very week over the next ten weeks, including the run-up to the November US presidential election. 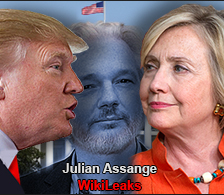 Did this letdown represent an empty threat or a form of Chinese drip torture for keeping Assange and his Wikileaks organization at the shadowy center of the US election campaign, alongside its two contenders, the Democratic Clinton and Republican Donald Trump? Or was this an Assange ploy to conceal his empty arsenal? In a PS, he promised leaks on “three governments” which he did not identify. For background, ready debkafile’s earlier report Tuesday. US Democratic candidate Hillary Clinton’s machine-gun assault on Republican Donald Trump has peaked in the last few days on the principle that offense is the best form of defense. By swamping the media with snipes against Trump’s forte, his flaunted success in business – how he lost a billion dollars in a single year on a bad investment in a casino and got away with 18 years of federal tax immunity – she hoped for a distraction. Assange has long claimed that his personal safety is at risk. His allegations against Hillary Clinton are claimed to derive from email communications WikiLeaks has hacked, which are said to present the former Secretary of State as corrupt and manipulative and a troublemaker. He is expected to use the information for another attempt to upend her run for president. They were discussing how to prevent WikiLeaks from releasing 250,000 secret cables that revealed a huge amount of damning communications between State Department officials and its foreign allies between 1966 and 2010. In 2010, Assange had already released records that divulged secret US documents about the war in Afghanistan in July and about the war in Iraq in October. Clinton and the Obama administration feared the content of the cables would damage US intelligence gathering operations by blowing the identities of agents as well as compromising private communication and intelligence shared in undercover deals with foreign governments. It was decided at the end of the discussion to offer a $10 million reward for bringing Assange to justice in the United States, comparable to the bounty offered for high-profile terrorists. This summer, WikiLeaks cast a heavy stone at the Clinton campaign by releasing 20,000 stolen Democratic National Committee emails showing how party officials had tried to undermine her rival Bernie Sanders. The DNC chair Debbie Wasserman Schultz and other members were hastily forced to resign and Hillary, though bruised, went on to win the party’s nomination shortly after. Since then, Assange followers have hinted that the emails were leaked by the Democratic National Committee official Seth Rich, who was shot in the back while walking on a Washington street on July 10. His murderer was never found. The Berlin event will celebrate the 10th anniversary of the founding of WikiLeaks and its publication of more than 10 million leaked documents. Hillary Clinton and many in the US intelligence community accuse Assange of acting for the Russian secret service as Vladimir Putin’s tool for meddling in America’s election process. This accusation is intended to undermine his credibility. Its weakness is that no evidence has been found to substantiate it.